Endometriosis is a condition in which normal uterine lining grows in an abnormal location, causing infertility and/or pain. However, this condition is treatable, and Ovation Fertility™ partner physicians are here to help. Each month, granulosa cells around the egg make estrogen, which causes the uterine lining to thicken. When it’s time to ovulate, the granulosa cells produce both estrogen and progesterone to help prepare the uterine lining for pregnancy. Normally, estrogen and progesterone production stops if a woman does not get pregnant that month. The uterine lining then dies and comes out as a period. However, in some women, some of the cells stay alive and flow back through the fallopian tubes, instead of out of the cervix. These cells can then land on other pelvic organs, including the ovaries, intestines and lining of the abdomen. From there, the cells can attach and continue to grow, forming areas of endometriosis called implants. The implants will continue to grow and will sometimes bleed. This can lead to pain, scar tissue and ovarian cysts. Studies suggest that 25% to 45% of all women of reproductive age have endometriosis. Some studies indicate that the rate of endometriosis in women with infertility is as high as 65%. Endometriosis is a common condition, but it can also be a strange one in terms of its symptoms. Some patients may experience excruciating pain and severe symptoms, while others may not experience any symptoms. The first step in diagnosing endometriosis is taking a complete medical history. Physicians will want to know about the sufferer’s pain, menstrual cycle and family history. The next step is to perform a physical exam, which will involve pressing on the abdomen and performing an ultrasound exam to check for cysts and scarring. After the exam, the fertility doctor may determine the woman needs further testing, such as a laparoscopy to look for small adhesions and cysts that cannot be seen using an ultrasound or MRI. For women looking for relief from the pain caused by endometriosis, Ovation Fertility™ partner physicians can perform minimally invasive laparoscopic surgery using lasers to remove endometrial implants and adhesions. To help women who want to become pregnant, laparoscopic surgery can remove the adhesions and scar tissue that may interfere with ovulation, embryo implantation and fallopian tube access. 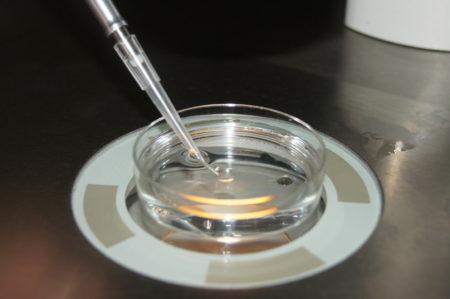 If the scar tissue is very severe, the fertility physician may recommend IVF as the next best treatment. Because of the nature of endometriosis, some women may require additional treatments during their reproductive years; however, others may not experience any more problems after treatment. For more information about endometriosis, please contact us today.